White Ribbon Day Affiliates support local Ambassadors and sponsor local town, school and community proclamation events. We now have white ribbon pins available for purchase on our site. Join the cause today and purchase pins for your organization. JDI has created this WRD toolkit packed with ideas and resources for you to use in your community.This toolkit includes a compilation of resources, which include: discussion guides, and examples to help organize, educate, and engage your community. 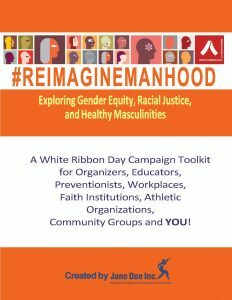 Whatever event you plan to hold, we invite you to promote gender equity, racial justice, and healthy masculinities. Please let us know if you find the toolkit helpful. Be sure to contact us if you need any support or guidance in developing activities to engage your community in the prevention of gender based violence.